Damn the Witch Siren aim for sensory overload. Attend one their electrifying live shows and you’re likely to see choreographed dance moves, seizure-inducing visuals, and two hyper-active lovebirds buzzing in a cacophony of 8-bit arpeggios and blunt electronic beats. The multi-media onslaught of Bobbi Kitten and Z Wolf truly has no precedent or peer among the Columbus scene. They’ve got to be the only band in town who reps a film projector as their third member. Theirs is as much a rock concert as it is an exultant sideshow. 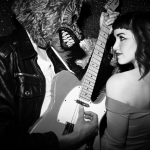 Kizmet brought them together, as Kitten literally went searching for Wolf when she spied him in a photo with his former band, the Town Monster. From the start of their relationship, their intentions in music making was as much influenced by ‘80s pop like Oingo Boingo and Madonna, as it was by the shocking performance art of Lady Gaga. It was a match that led to their debut, the tellingly titled, but somewhat rough around the edges, Let’s Fall in Love. With the release of last month’s Superdelicious – which they played, produced, and mastered in the apartment they now share – Damn the Witch Siren’s dynamics have sharpened into slick high-energy dance music with a thumping industrial clang. Much of it passes in a blur of neon and glitter, like the sensation one might get from living in a Japanese pachinko machine, but Kitten provides plenty of sticky hooks that prove they’re serious when they talk of aspirations to become legitimate pop stars.